I admit to being a bit of a revolutionary history geek. I've read a whole lot about Ben Franklin and lately I've been re-reading Walter Isaacson's 2003 biography "Benjamin Franklin - An American Life". After all, it's been four years since I last read it. Ben Franklin believed in the common individual citizen and he believed in the power and wisdom of exploring the world around him. Often, this exploration took the form of debate. He was also the original American networking king who formed what he called the "Junto" to discuss events and forge relationships. In the time we live in today, so much of our communication is quick and informal and never moves beyond "hey, how are you". I wonder if we stop often enough and explore the world around us. Are we taking time to evaluate what is going on in our country? Or, are we prone to staying busy in our own little world? While reading the other day, I ran across Franklin's list or guide for the type of conversations the "Junto" might engage in. It's kind of funny and obviously not of our time, but it is worth checking out. Have you met with anything in the author you last read remarkable or suited to be communicated to the Junto? Hath any citizen in your knowledge failed in his business lately, and what have you heard of the cause? Have you lately heard of any citizen's thriving well, and by what means? Do you know of any fellow citizen who has lately done a worthy action deserving praise and imitation? Or who has committed an error proper for us to be warned against and avoid? 14. Have you lately observed any defects in the laws of your country of which it would be proper to move the legislature for an amamendment? 15. Have you lately observed any encroachments on the just liberties of the people? 16. Has anybody attacked your reputation lately, and what can the Junto do towards securing it? 20. In what manner can the Junto or any of them assist you in any of your honorable designs? For Liberty and Glory - "Washington, Lafayette, and their revolutions"
For Liberty and Glory is a dual biography of sorts looking at the lives of George Washington and the marquis de Lafayette. The book's dust cover says "James R. Gaines provides fascinating insights into these personal transformations and is equally brilliant at showing the extraordinary effect of the two "freedom fighters" on subsequent history." First of all, I can agree that George Washington and marquis de Lafayette were indeed "freedom fighters". What peeves me a little is that idea of "freedom fighters" has been co-opted to the point where it doesn't have the kind of historical meaning that a defining term like this needs when trying to categorize an icon of George Washington's stature. I say this mainly because I am a huge fan of Washington....but I digress. 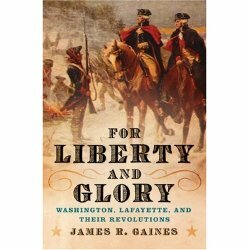 Right from the start Gaines begins weaving the story of Washington and Lafayette together. And I have to admit, it worked for me. I have read much on Washington and I did have some understanding of the Washington/Lafayette relationship, but this book gave me a stronger understanding of how important that relationship was to Washington both personally and professionally. Prior to reading this book, I thought of Lafayette as a man who played an important role in the Revolutionary War, but his story was always secondary to whatever I was focusing on. This book really brought Lafayette's role into focus as pertaining to the war and how crucial his relationship and his work were to Washington. Ultimately, Lafayette rose to hero status in the hearts and minds of the American people of the early 1800's. There are a couple of things about the book that I consider drawbacks. One is that this book often has very little to do with Washington and Lafayette together. In other words, at times I felt as if I were just reading a biography of Lafayette or a biography of Washington, instead of the story of both of them. Also, author James R. Gaines seemed to sometimes slip into an academic discussion that was pretty dry. As I stayed with the book, he always snapped out of it and got back on track, but there are some pretty dry stretches of pages. Having finished For Liberty and Glory, I would recommend this book to those that are interested in American and French Revolutionary history. I can say that I really enjoyed learning more about Lafayette, and for that reason alone, this book was worth the read. 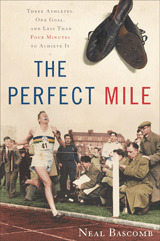 The Perfect Mile is a well written book that captured the feel of the time, the feel of the competition, and the uniqueness of what drove each man toward this historical event. One of the really fun things about this story is that even if you know who ran the first 4 minute mile and maybe even if you know who the three characters were that were competing to do it (doubtful), Neal Bascomb makes this drama come to life by helping us get to know these guys and making it feel like we have a front row seat on their lives. A couple of years ago I read a book titled "Three Roads to the Alamo". This book could have been titled Three Roads to History or Three Roads to the 4 Minute Mile. I had no idea that the chase for the 4 minute mile captured the imagination of millions of people and much of the developed world. It truly embodied the idea and the dream of the amateur athlete. The United States was represented by the farm boy from Kansas, Wes Santee. Wes was a scholarship athlete at the University of Kansas who learned painfully that the AAU was not what it should have been. Australia was represented by the well bread John Landy. Landy was indeed a training freak who was nothing if not single minded. He was the true, fast as lightning, front runner. And Great Britain was represented by the medical student, Roger Bannister. Bannister had a cast of characters around him that pushed and prodded and helped him along in his quest for the 4 minute mile. This book captured me and my competitive spirit. I found myself cheering on each of these guys at one time or another. Neal Bascom did a very nice job developing the characters and re-creating the excitement felt across the globe as history drew a bead on the 4 minute mile. Raving Fans is a very short, concise book taking a look at the very basic principles of strong customer service. If you're looking for a step by step detailed customer service manual, you will be disappointed with Raving Fans. However, if you would like to spend a few hours on the basic principles to build a solid customer service environment, you may enjoy Raving Fans. Stylistically, the authors use a silly sort of episode to create reader interest. In fact, the key character and customer service guru is a man named Charlie who is a Fairy Godmother. I'm not going to try to explain that, but in some very odd way it seemed to work. As simple as that is to write, I can tell you as a guy who manages a group of customer service and sales people, it is easy to loose track of these guiding principles. If you look at these principles one at a time, it is easier to understand why it is easy to loose track of them. For instance regarding principle one and two, things change. Visions that once were relevant become outdated. Your vision may no longer make sense in the changing world of Yahoo and Google search engines. And, your customer may need and want a completely different level of service than they once needed. Principle three is to improve by 1% on a regular basis. If simple to understand, principle three seems like it may be very difficult to measure. Unless management makes it a priority; and, without a diligent day to day effort, employees will turn to following the rules instead of consistently improving on the level of customer service. I enjoyed this book. Raving Fans is a quick read and a good reminder of the basics of customer service. Ayn Rand, author of Atlas Shrugged, was not just another writer of novels. She was a truly brilliant writer whose style drew me in as a reader. She writes in detail that is astounding in its clarity, yet not tedious or boring. She was indeed an intellectual and her life philosophy of Objectivism continues to hold a loyal following. However, I most certainly do not agree with at least some of her philosophy. For instance, it is important to know going in that Ayn Rand was an atheist. Her feelings toward Christianity, God, and religion in general do come through in her writing because again, she was not just a writer of novels; she was an intellectual who wrote novels as a means of propagating her Objectivism philosophy. Personally, I am a faithful Christian man and a believer in Jesus Christ as Savior and King. I found the atheist part of her philosophy as a real disappointment. And, I found it to be a suspension on her part of the reality of a created universe.....but I digress. Why did I read the modern classic Atlas Shrugged? Because someone recommended it at a business meeting and when I saw the size of the book at the airport book store, it looked like a challenge. The soft cover copy I bought as about 6 point type and all of 1065 pages. Yikes. Atlas Shrugged is the story of a society that has slumped to the point where the most are living off the backs of the few. The government regulates everything, propagates political correctness, and tries to make things "fair", which generally means unfair to anyone who is actually working. Industrialists are thought of as pariahs in society, even though they are the only ones who are holding together what is left of society. It is a society slouching toward a state of complete breakdown. But, we have a cast of interesting heroes that are fun and admirable and single minded in their pursuit of business success. The central, albeit strange question, is "Who is John Galt"? You will get a feel for what is meant by this question in the first half of the book, but prepare to wait for the answer. And once the full answer comes, you may find yourself feeling as if you had left the fun novel Atlas Shrugged and entered into the land of nauseating explanations to Objectivism philosophy. But, don't despair. This is only 5% of a very well written book that was also a fascinating read. With this said, do I recommend Atlas Shrugged. Yes, of course. It's awesome. Am I a convert to Ayn Rand's Objectivism philosophy? Hell no. Into the Wild is about a lot more than a four month odyssey into the Alaskan bush. It is about a quest for signif icance by a complicated young man who found meaning in experiences that ran contrary to what society might expect from a college graduate of Emory University. Some of us, most often young men, need to define our world and our limits, on our own. Chris McCandless was most certainly one of these young men. He found meaning on the bleeding edge of existence. He was complicated, but was in search of simplicity. He was sensitive, but sometimes appeared calloused toward those closest to him. He was opinionated and selfish and at the same time a confidant, and caring good friend. Author Jon Krakauer seemed to be in a unique position to tell this story because of his own similar experiences. I think he does a very nice job honoring Chris's story and bringing through the human experience of Chris McCandless (a.k.a. Alexander Supertramp) over the final two years of his life. I recommend this book highly. An easy, yet thought provoking read. "Two years he walks the earth. No phone, no pool, no pets, no cigarettes. Ultimate Freedom. An extremist. An aesthetic voyager whose home is the road. Escaped from Atlanta. Thou shalt not return, 'cause "the west is the best." And now after two rambling years comes the final and the greatest adventure. The climactic battle to kill the false being within and victoriously conclude the spiritual revolution. Ten days and nights of freight trains and hitchhiking bring him to the great white north. No longer to be poisoned by civilization he flees, and walks alone upon the land to become lost in the wild." This is Ishmael Beah. And the book, a long way gone, is his story. Over the course of a number of weeks, I saw Ishmael's book advertised inside Starbucks Coffee locations. The dust cover of the book demanded my attention with the picture on the front of a very young boy with an AK47 on his back and an RPG over his shoulder. The back of the dust cover has the picture you see to the left. A good looking, bright eyed young man whose smile draws you in closer. Ishmael was born in Sierra Leone in 1980. He lived a normal life until the age of 12 when civil war began to grip the country. As Sierra Leone spiraled further and further into war, the rural countryside began to be swallowed up by both government and rebel soldiers. Ishmael lost his family and began wandering the forest looking for food, shelter, and security. What he found was an army recruiting children to fight a grotesque civil war dominated by heavy drug use and unimaginable execution style killings. I found a long way gone both difficult to read and difficult to put down. Difficult to read because of the graphic violence, and difficult to put down because of the extraordinary nature of Ishmael's story. This is an incredible story of resiliency. It is a story of love and brutality and rehabilitation. It is Ishmael Beah's story. I recommend this book to readers 16 and older. This is an incredible story, but if you cannot handle significant violence, this book is not for you. Currently I am reading the book Blue Ocean Strategy. First, you should know that I am only on page 120 so this is a "so far" review. The book lays out an idea and a strategy regarding how to grow markets within any given industry. It provides what I would call a broad based strategy to help identify uncontested new market space through "value innovation" as opposed to a more standard approach of creating competitive advantage inside markets that already exist (these markets are referred to as "red oceans"...get it, bloody red from the competitors beating up on each other). What has me excited so far is that I find myself thinking of ideas in my industry that I have not considered before. Conventional thought processes spawn conventional wisdom that traps us inside the standard strategies of beating the competition by producing products cheaper, finding incrementally better processes, or outselling your foes. Blue Ocean Strategy is about finding ways to move away from the competition thereby growing new markets across industry groups, strategic offerings, and the scope of a product offering. So far at least, I give the first 120 pages an "A" for both content and readability. Have you read this book? If so, what do you think?